Vermonters, of course, know that Sanders is anything but dull; we’ve been feeling, seeing and hearing the Bern for almost 40 years. In fact, Joel Najman, host of Vermont Public Radio’s “My Place,” crafted on-air comedy by sending up then-mayor Sanders as far back as the ’80s in WQCR/WJOY radio rascals Jim Condon and Louie Manno’s “Leave It to Bernie” sketches. Among the national electorate, however, Sanders can still come off as gruff and a bit detached — a candidate more comfortable talking numbers than kissing babies. Visually, Sanders doesn’t do much to help his cause. With his rumpled suits, “cotton-candy hair” — as Adomian describes it in the video — and cantankerous voice, Sanders reads like a caricature of an old man yelling at kids to stay off his damn lawn. As candidates go, he’s prime for parody. In a recent phone interview, Adomian spoke with Seven Days about his Bernie comedy video. He says Vermont’s junior senator has been on his radar for some time now. According to Adomian, he’s had the Bernie impression in his pocket for a while. Sanders’ White House bid finally gave him an excuse to use it. The week Sanders announced his candidacy, Adomian informed the various shows and podcasts on his appearance schedule that that he’d be going on as Sanders. He and writing partner John Roy also began working on the video for Funny or Die. Adomian compares Sanders to that college professor all the students make fun of but still like. The video reflects that affection as it plays on Sanders’ idiosyncrasies. We see Adomian as Sanders in various situations pitched to showcase the elder statesman’s coolness: He parties with millennials, dances at an LMFAO concert and skateboards. This last bit is particularly well observed. Clad in a suit and safety gear, Adomian’s Sanders clumsily rolls down a sidewalk atop a skateboard, briefcase under his arm, as he drones about percentages of percentages. Adomian says the scene was the first one that popped into his head when he began writing the video. The rest of it flowed from there. On the surface, the video is good for a laugh, as it deftly parodies Sanders’ trademark crustiness. 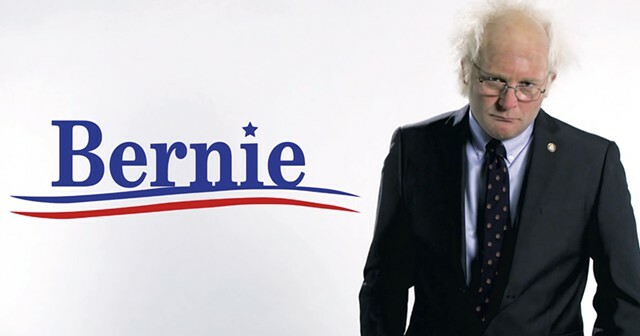 Physically, Adomian credibly reproduces Sanders’ signature disheveled anti-look. A closer reading, however, plays up Sanders’ unshakable authenticity and earnestness. Where many candidates become political chameleons to win votes, Bernie can’t help but be Bernie — maybe to a fault. Sure, he’ll do a keg stand, but he’s going to talk about the tax burden on the bottom two quartiles while he’s doing it. The real trick to capturing Sanders is digging into his proclivity for wonky policy-speak, which is an improvisational gold mine. When Adomian is at a loss for words, he knows he can fall back on statistics and economic gibberish delivered in his Sanders voice — which the comedian compares to “a bullfrog with the personality of a library card” in the video. Explaining his method of developing impressions, Adomian says he’s after something more than mimicry. Unlike a technically proficient impressionist like Rich Little, Adomian is more concerned with comedic effect than accuracy. His impressions mine humor from specific details — mannerisms, quirks — going deeper than simply doing a voice to find out what makes that person tick. Sanders isn’t Adomian’s first foray into political impressions. He was the in-house George W. Bush on Craig Ferguson’s “Late Late Show.” He’s also gotten a lot of mileage out of former Minnesota governor and professional wrestler Jesse Ventura. As a teenager in Los Angeles, Adomian used to call in to local talk radio shows pretending to be California politicians. Asked if he’s received any feedback about the video from the Sanders campaign, Adomian says he’s pretty sure Sanders has seen the video but doesn’t know what the candidate thought of it. It’s hard to imagine Sanders, focused on the day’s most pressing issues, giving it much thought. In a recent New York Times interview, he was bluntly dismissive of frivolous attention. His comment about his campaign’s social media strategy? “People don’t need to know what I buy in the grocery store or what the name of my dog is — I don’t own a dog, by the way — but they do need to know why billionaires are getting richer and the poor are getting poorer,” Sanders said. With no shortage of material, Adomian says he will keep doing Bernie during the campaign. He’s even worked the impression into his standup act, fielding questions from the audience as the senator.